With the start of 2018, Cañada alumnus, David Lopez, reminds Cañadians why they’re here and why the College is so special. David Lopez’s story is heartwarming and inspirational. When he first came to this country, he struggled with English and found Cañada as his home away from home. Here, he created a strong foundation with faculty, students and staff, and garnered the English language skills he needed to procure himself a successful career. David felt that he could never repay Cañada College for everything that it has given him. 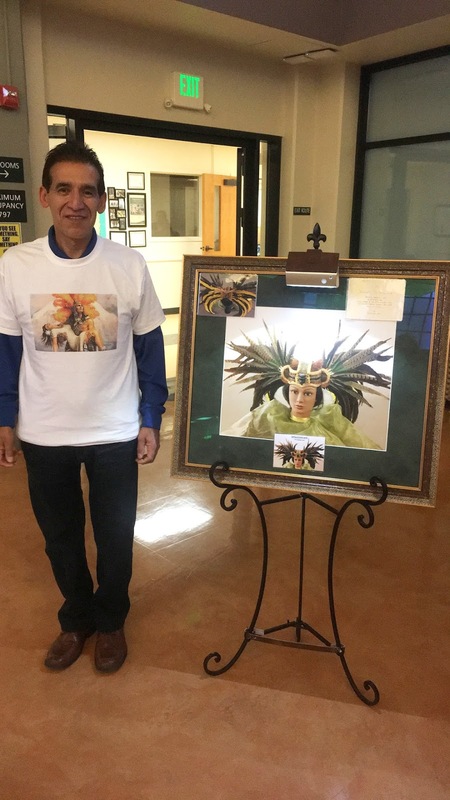 Over time, he saved up his money and created an incredible historical Aztech feather headpiece, worth hundreds of dollars, to donate and display at the Cañada College Library. David continues to come back and serve Cañada because of his faithful gratitude to the College. He worked, in collaboration with The Center for Student Life and Leadership Development, to bring on cultural performers and workshops for their Heritage Month celebrations, and has even donated another education piece of artwork. His cultural headpiece and educational history display can be seen in the Cañada Library. Thank you, David, for your generosity and for reminding the campus community that being a Cañadian truly means supporting one another and providing a safe place for students to succeed.